WASHINGTON – Tucson resident Greg Shimn knew he would have had a better view of the ceremonies from his couch back home, but there was no way he was going to miss the chance to be there in person for Donald Trump’s inauguration. 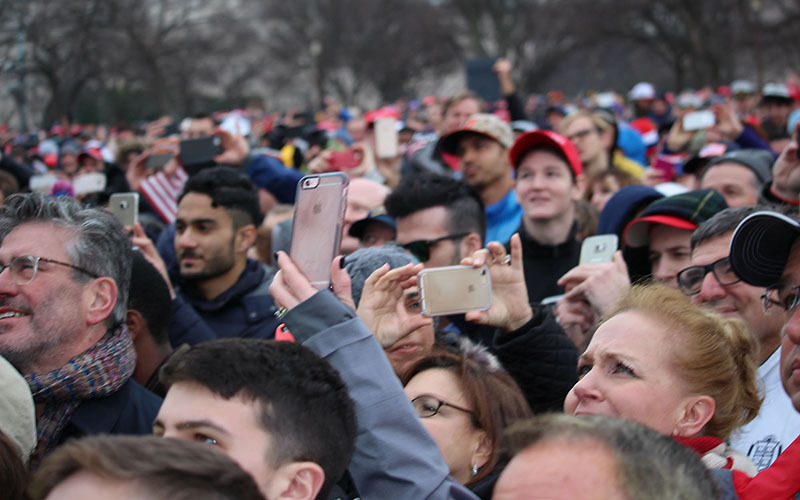 Shimn was one of thousands on the National Mall, many sporting Make America Great Again hats like him, who used words like “historic” to describe the inauguration under cloudy and chilly Washington skies. Trump sounded many of the themes of his campaign, promising to put America first, and the event occasionally took on partisan tones. But the mood overall was calm, with most in the crowd enjoying the moment after a bitter campaign. “This is a watershed moment, we’re covering ground that we’ve never covered before,” Shimn said. Trump supporters point to his unconventional background, noting that he does not have a background in politics or government, just the kind of change they think the country needs. But for an unconventional candidate, Trump was inaugurated in a conventional ceremony, standing on the West Front of the Capitol with his hand on the Bible while the chief justice of the United States administered the oath. There were prayers and musical selections and a parade of Washington officials before Trump gave an inaugural address – that was unconventionally short, clocking in at 17 minutes, and heavy on anti-Washington rhetoric. A light rain was falling as Trump vowed to “put America first” and told the crowd “we are transferring power from Washington, D.C., and giving it back to you, the American people.” The president assured Americans that they “will never be ignored again,” as cheers and chants from the crowd followed most of Trump’s pledges. The speech repeated many of the themes of his campaign and the ceremony had the same partisan overtones, with Democrats on stage booed, including outgoing President Barack Obama and Trump’s opponent in the campaign, former Secretary of State Hillary Clinton. 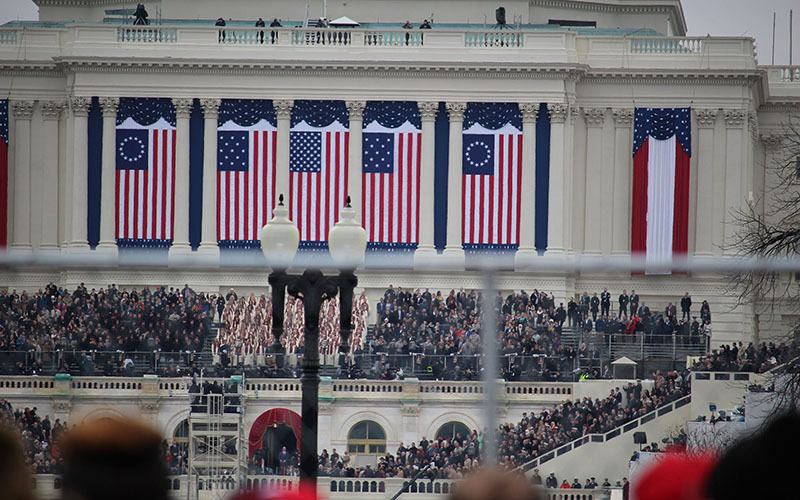 The crowds were not as large as in recent inaugurations, but what it lacked in numbers it made up for in enthusiasm. 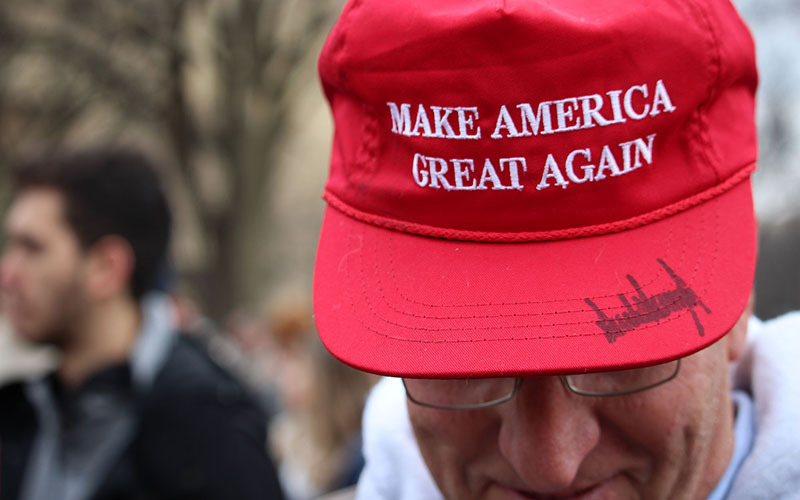 Thousands stood shoulder-to-shoulder in a sea of red hats and Trump memorabilia under a damp, gray sky. It was that enthusiasm that drew Shimn, 61, to his first inauguration. He said he came for the atmosphere, the energy and to be around the people. “Frankly if you wanted to see it, you’re better to stay home and watch it on TV,” he said. It didn’t hurt that Harris is a Trump supporter. “I just feel like the country has been going in a wrong direction and we need a change,” she said. That’s not what attracted Tempe residents Kevin and Denise Brown, who said they were hoping to attend Clinton’s inauguration. But they were on the Mall with their 12-year-old son Friday because they think it is important for him to be there for the transfer of power – a popular phrase among Trump supporters. “We are excited to be here, but it would’ve been better if we were here to see someone else,” said Brown, whose son appeared to be less than enthused to be there regardless of who was being sworn in. Recent Arizona State University graduate Sam Levine declined to say who he favored in the campaign, but said he came with friends to be a part of the excitement. “More than anything, whether you’re for or against him (Trump), it’s history in the making,” Levine said. 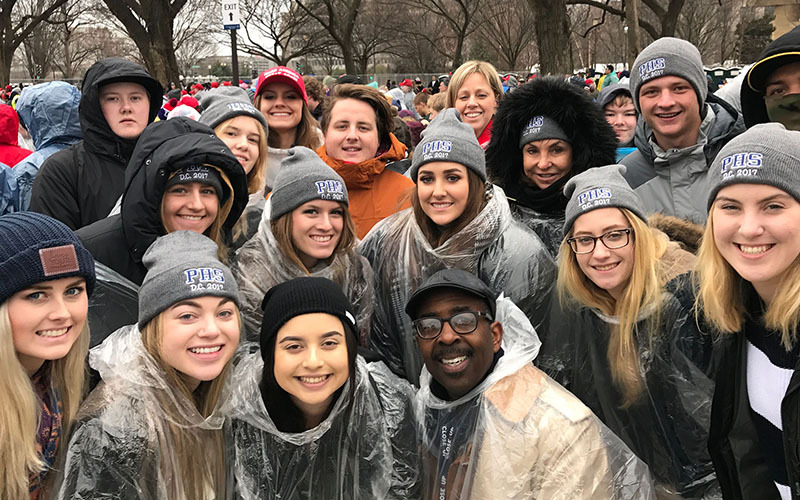 The crowd included 19 students from Gilbert’s Perry High School, juniors and seniors who were in Washington with their English teacher, Cindy Pino. – Cronkite News reporters Bo Tefu and Joseph Guzman contributed to this report.